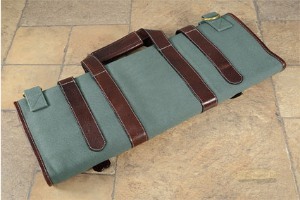 Description: Boldric's knife rolls are a safe and attractive way to carry your knife. The 17 Slot Abalone Canvas Knife Bag with Leather Trim (CK106) is well designed and built to last. 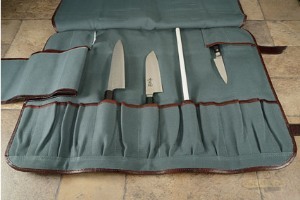 This 100% cotton canvas roll has sewn slots to hold knives in place and a flap to prevent them from falling out. 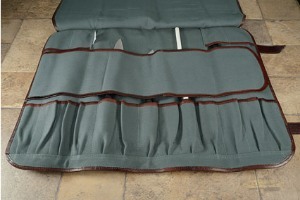 Seventeen slots have an overall length of 18 inches. 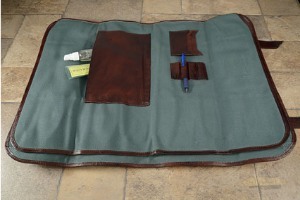 Sewn buffalo leather loops for pens, business card pockets, and a utility pocket (perfect for holding a tablet). The cotton canvas is waterproof. Buffalo leather trim is an elegant and durable accent. Solid brass buckles. 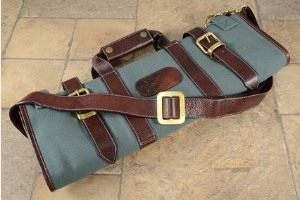 Buffalo leather shoulder strap is included. 0.08984375 0.078125 89.84375 78.125 Header Started. 0.28125 0.03125 281.25 31.25 Trailer Started. 0.41796875 0.13671875 417.96875 136.71875 Trailer Completed.